Beijing, China, December 6, 2015 /ChinaNewswire.com/ - Wanda Realm Beijing, together with 3rd Times Art Space, has created a new art space in Shijingshan called Art Realm. 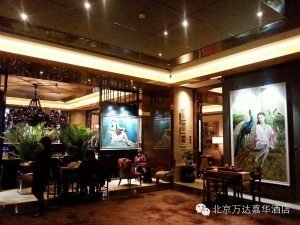 Located at the Wanda Realm Beijing Lobby Lounge, it strongly advocates changing the traditional understanding of art exhibitions. It will break the old pattern that only art museums or galleries can host art exhibitions. Art Realm combines the hotel venue space and art, and presents the unique charm of art to the public. We believe that Art Realm is the first art space in Shijingshan district, and will soon be the most representative art venue in western Beijing. All 26 paintings featured in "In The Mood For Love" are from Ren Yi Hong's classic works, and give viewers artistic enjoyment and edification. More art exhibitions will be held in Art Realm periodically, such as solo exhibitions and more theme exhibitions. Once this art space becomes better known, Wanda Realm Beijing will keep creating opportunities for young painters with great potential. Born 1990 in Shanxi Province, Ren Yi Hong is a professional painter and artist. In 2008 she was admitted to the Central Academy of Art and won a scholarship and the outstanding work award. In 2010, Ren was assigned to the Paris Academy of Art as an exchange student. Her representative works include "The girl with a guitar", "Summer night", "Morning", and "The girl with a peacock". Wanda Realm Beijing is located in the heart of Shijingshan District and Capital Recreation District (CRD), which is adjacent to the Shijingshan Wanda Plaza and walking distance to a subway station (Line 1) and the airport shuttle bus station (Shijingshan Line). It is only 45 minutes away from Beijing Capital International Airport by car and 25 minutes away from the Summer Palace and Fragrance Hill. Wanda Realm Beijing is equipped with 308 magnificent guestrooms and suites which are designed for unparalleled comfort and pleasure, featuring two restaurants serving different cuisine, from formal dining to a relaxed buffet. For events large or small, Wanda Realm Beijing is at your service with the leading banquet facilities in western Beijing. Choose from a graceful selection of fully equipped meeting rooms, while the spectacular 1,400 square meter pillar-free China Grand Ballroom is equipped with an 8.5 meter-high ceiling and a 70 square meter LED screen. The first-class leisure facilities provide business travelers with a gathering place to refresh body, mind and spirit, including a state-of-the-art gym and an indoor heated swimming pool. 3T Art Space is on south bank of Tonghui River, Chaoyang District. Located in Gaobeidian Cultural & Art Park, it is in front of the terminal, and close to parks and recreational places. In line with the past, present and the future, 3T Art Space is looking into the art in the past, the present and the future impact of modern artistic forms of cognition. Each of the exhibitions is a time-oriented mode. It is not only a gallery, but also a brand new Gallery Mode, the coffee gallery. In appreciation of the art works at the same time, the taste of a cup of hand-ground coffee could bring your mind to feel the art movement.